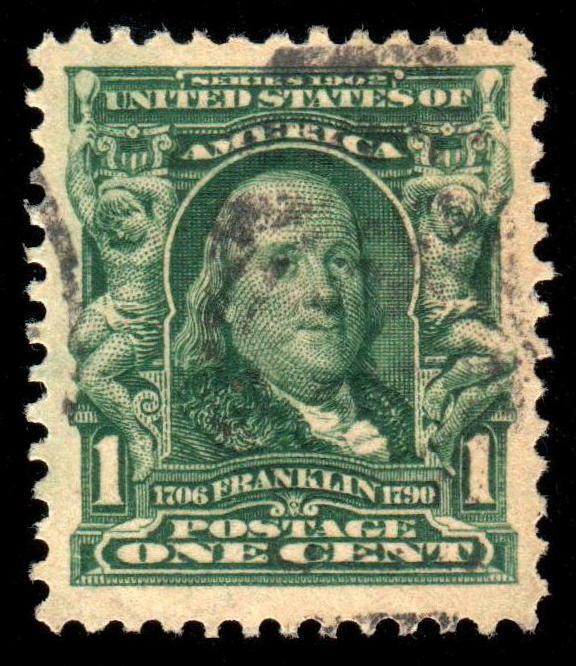 Issued in February 1903, the 1¢ stamp was one of the workhorse stamps of the 2nd Bureau issue. 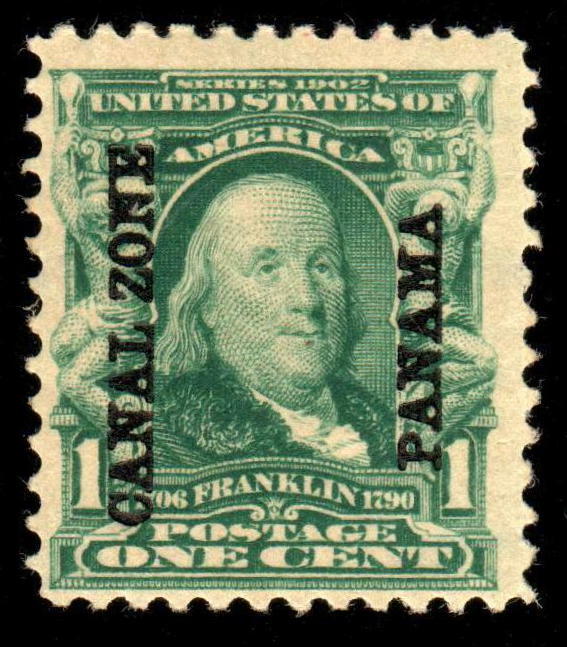 During the turn of the 20th century, the boom in the popularity of the penny postcard created considerable demand for the 1¢ franking. 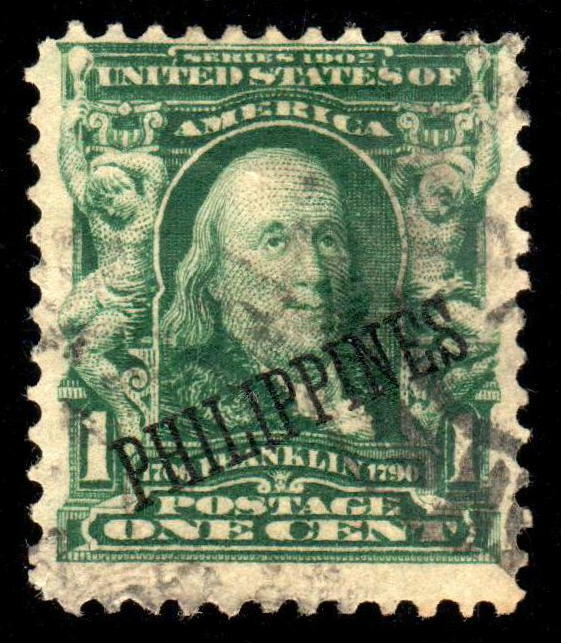 The stamp sought use on every form of mail paying virtually every rate. 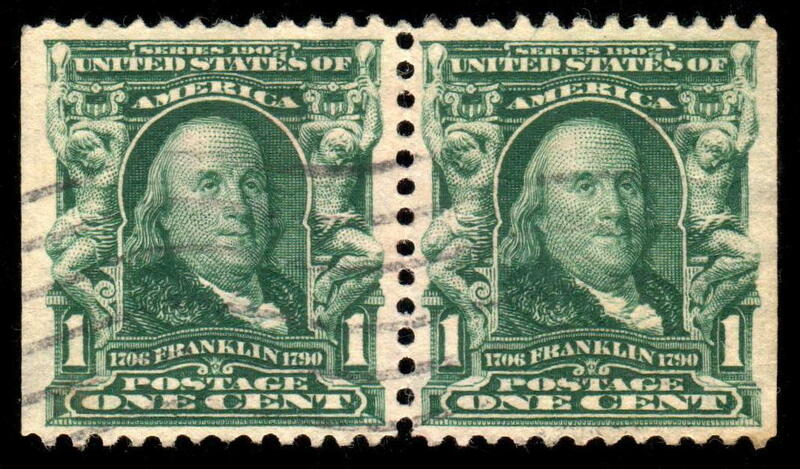 Several Franklin varieties were produced including booklet panes, imperforate stamps, and coils. There are numerous solo franking possibilities, including the penny domestic postcard, unsealed newspapers or magazines (2nd class mail, 1¢ / 4oz. ), circulars (3rd class mail, 1¢ / 2oz. 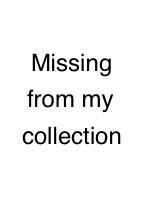 ), and samples or merchandise (4th class mail, 1¢ / 1oz.). In the early 20th century postcards were used like modern day text messages. Millions of cards were produced and sent domestically for a mere penny. At the same time, one of the leading causes of death in the U.S. was tuberculosis. Many afflicted with the illness were sent to sanitoriums for treatment. In 1907 Emily Bissell with the American National Red Cross created the first U.S. Christmas seals to raise money for a small sanitorium in Deleware. (See the American Lung Association). The seals were sold at post offices for a penny each and were most commonly affixed to postcards. Pictured below are postcards with the first U.S. Christmas seal (Scott catalog WX1) and a 1908 provisional seal from Poughkeepsie, New York. Dec 23, 1907, Philadelphia use of a Type I, “Merry Christmas” seal (WX1). After the success of the 1907 seal, the following year the American National Red Cross created a second Christmas seal and started selling them at post offices including Poughkeepsie, New York. Someone in Poughkeepsie decided the town should have their own stamp where the proceeds would go to charities in Poughkeepsie. The provisional Poughkeepsie Christmas seal is very similar to the Red Cross seal (Scott WX2). 1908 was the only year Poughkeepsie made a Christmas seal. Provisional Poughkeepsie Christmas seal sent Dec 23, 1908, from Salt Point, NY. Salt Point is a hamlet northeast of Poughkeepsie. Some amazing postcards and covers with Christmas seals were sold in 2011 by the Robert Siegel Auction firm. The United States acquired Puerto Rico, Guam, Phillippines, and Cuba from Spain on April 11, 1899, pursuant the victory in the Spanish American War. Subsequently, these territories along with Canal Zone and American Samoa became the U.S. Possessions. 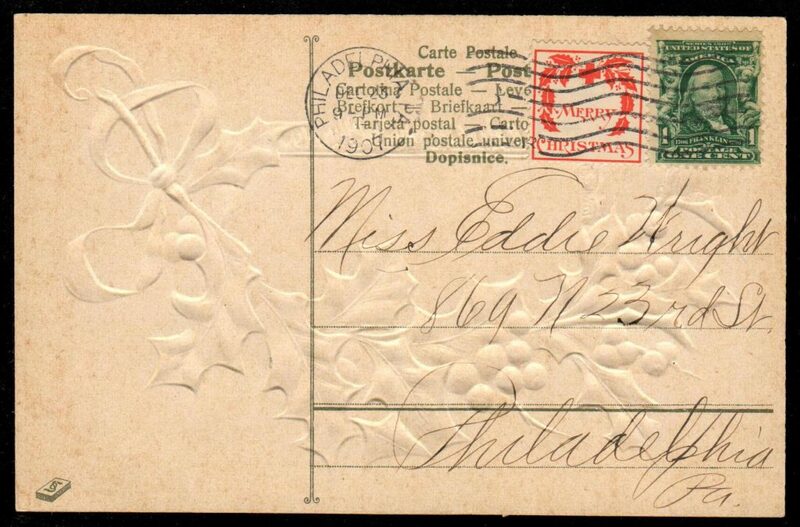 Though scattered around the world, the Possessions benefited from the same domestic mail rates as the mainland United States, namely 1¢ postcard and 2¢ letter rates. 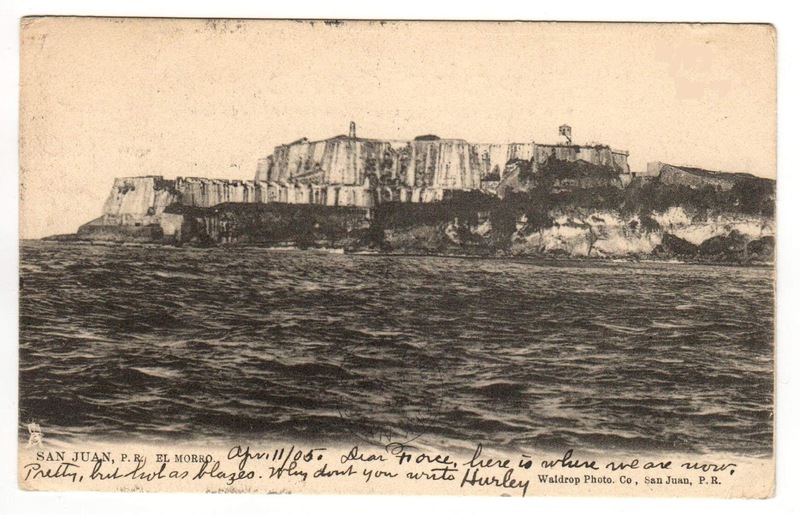 Displayed below is a picture postcard sent from San Juan, Puerto Rico to Manilla, Phillippines on April 11, 1905, six years to the day after the U.S. obtained these islands. The card was received in Manilla on June 2nd, 1905, and forwarded to San Francisco, California the following day. Finally received on July 11, 1905. 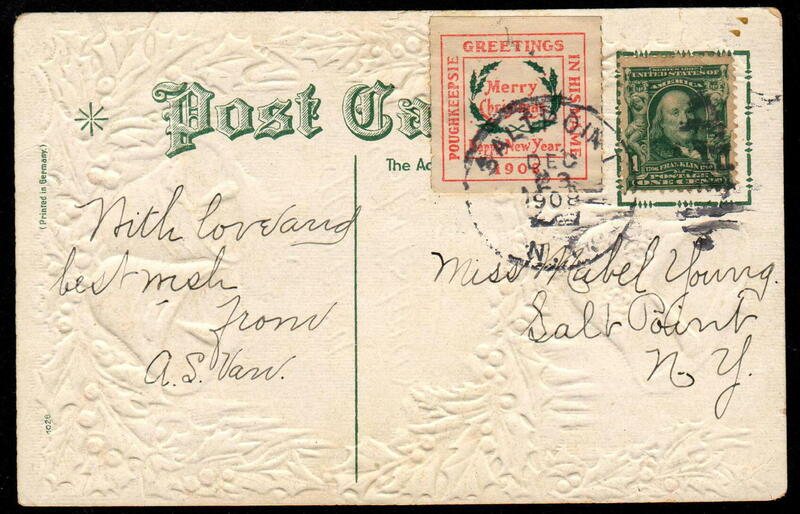 The 1¢ franking paid the domestic postcard rate between the Possessions as well as providing free forwarding service. 1905 postcard from Puerto Rico to the Philippines. Magenta receiving mark used by the U.S. Coast and Geodetic Survey. The Possession to Possession connection is neat, but what sets this postcard above the rest is the communication between two US Coast & Geodetic Survey (USCGS) assistant surgeons and the magenta receiving mark. The card was sent from the assistant surgeon, J.A. Hurley, of the USS Explore which was built in 1904 for the USCGS. Message from assistant surgeon J.A. Hurley on a picture postcard from Puerto Rico. The brief message and plea for correspondence were addressed to J. Neirson Force who was also an assistant surgeon on the USCGS “Fathomer.” . 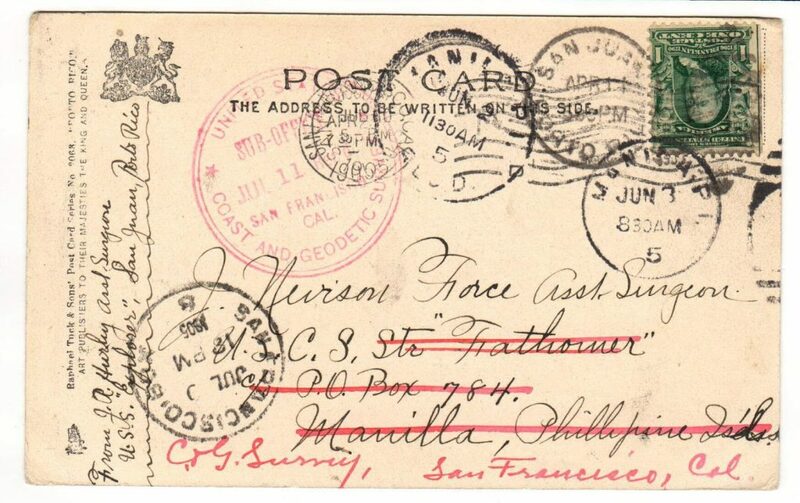 By the time the postcard made it to the Philippines, Dr. Force was reassigned to an office in San Francisco (I believe the notation on the card is C. of Survey, for Care of Survey?). The large circular United States, Sub-Office, San Francisco, Coast and Geodetic Survey receiving strike is not an official USPO postmark instead it is similar to marks hotels and corporations would apply as a service to indicate the mail was received. Any info or pictures of similar marks would be appreciated. What a destination! 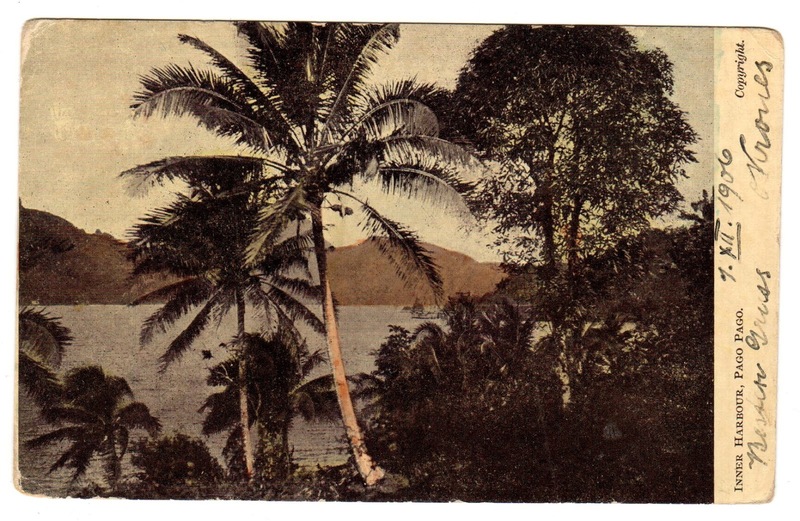 A postcard sent from Pago Pago, American Samoa, a United States Possession, to the small Marshall Islands atoll named Jaluit. 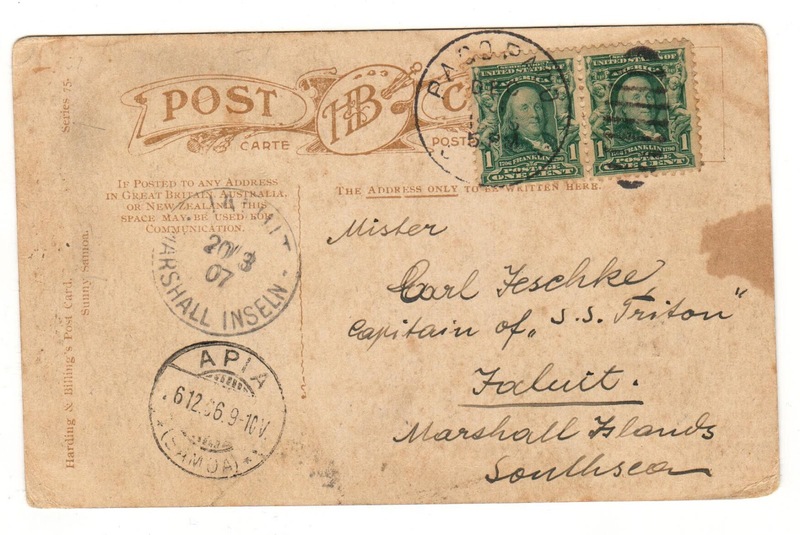 Posted December 1906, the card was quickly carried to Apia, Western Samoa where it probably sat waiting for a vessel bound for the Marshall Islands. It was not delivered to Jaluit until 20 March 1907. The German Empire purchased the Marshall Islands from Spain in 1885 and established a trading outpost on Jaluit Atoll. 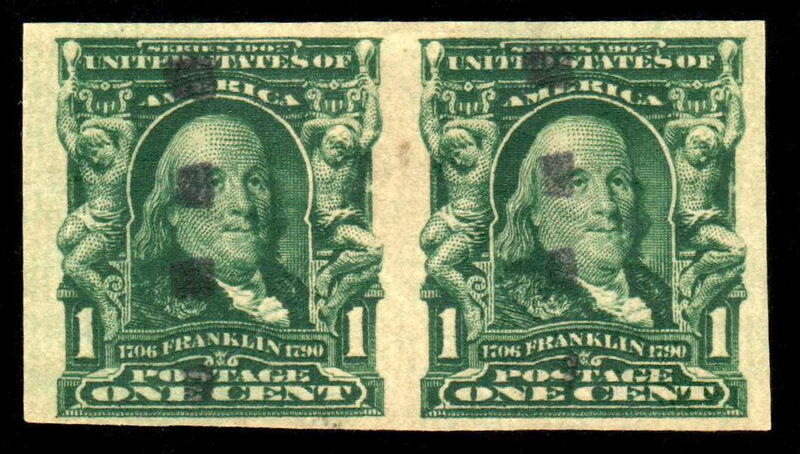 This card is franked with a pair of 1¢ definitive Franklin stamps (Scott #300) to pay the UPU postcard rate of 2¢. 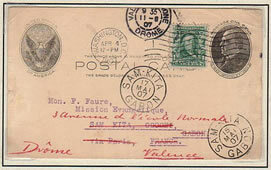 1907 UPU rate postcard from American Samoa to Jaluit, Marshall Island, Southseas. The postcard was sent to Carl Teschke, Captain of the SS Triton. However, I have not been able to find further information on either the captain or the vessel. Most likely one of the numerous small trade ships sailing the Pacific.